Great arty pic Duncan. Have a wonderful Wednesday. 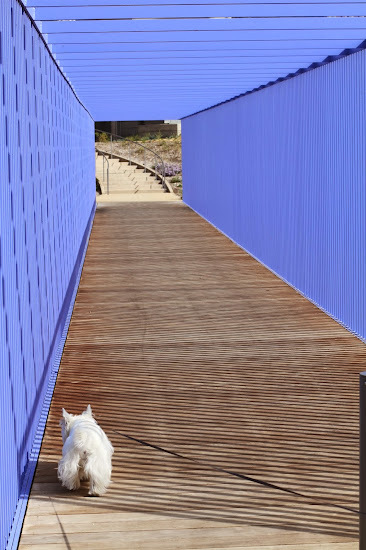 OMD, did you brighten up a most dull looking bridge! A journey through a tunnel? OMD! What a FABulous pic!!!! I loves that tunnel!! Ooooooo what's at the end of the tunnel? Looks like a great place for walkies. That is an awesome photo!!!! Hi to you - little one. Thank you for stopping by to see me. We think you are so cute! Love the photo. Your walk has a determined look about it Duncan. Those blue walls remind me of my agility tunnel. Are you doing some new form of agility? Finally, something to blog about!